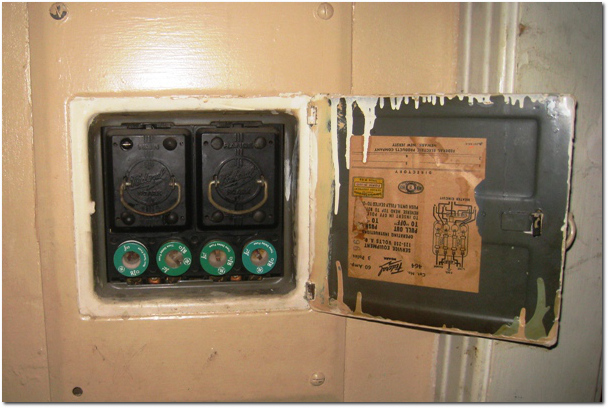 The other day we posted a picture of some old school fuses. Sticking with the electrical theme, here’s another situation we see periodically. Lights that you turn on and off by plugging in an extension cord. This isn’t the preferred way to control your permanent overhead lighting, and will be flagged by a home inspector every time. 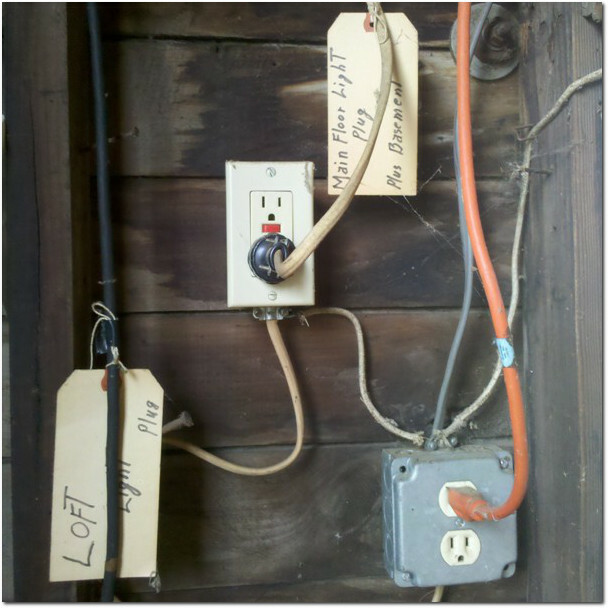 First, each of the cords is clearly labeled – which is great. There’s one for the main level and basement, and another for the lights in the loft of this unfinished outbuilding. Everyone should take the time to label the the circuits in their electrical system to make working with them easier in the future. The other interesting thing here is that the electrical system has been updated with a GFCI outlet like you see in bathrooms and outdoors. They couldn’t have taken a couple extra minutes to run proper wires and hook them up to two switches? What is the Historic Homes Rehabilitation Tax Credit? We’ve written two versions of the overview. The first was in 2011 and focused on the nuts and bolts of the program. The second was in 2012 that emphasized the value with an example. Read them before getting into this Q&A because they are better for background and understanding the big picture. Do I use the tax credit on my tax return or do I get cash? You do not use the tax credit on your tax return. The program is set up so that the tax credits are only able to be used by certain types of corporations. One specific example is Connecticut Light & Power, which the Hartford Preservation Alliance recently recognized for their willingness to buy tax credits from homeowners at face value. At the end of the whole process you will get cash. To quickly recap, once the projects on an application are complete, the homeowner goes back to the State Historic Preservation Office (SHPO) to turn in their documentation. SHPO reviews and (hopefully) approves the work. Next the homeowner lines up a buyer for their tax credit voucher and submits that information to SHPO. The voucher is issued directly to the corporation, who sends the homeowner a check once it is received. Does the work have to be completed all in one calendar year? No, the work does not need to be completed within either a calendar year or a tax year. Once an application is approved, the credit funds for the project are reserved for, and allocated to, that homeowner’s application. However, a homeowner cannot collect the tax credit, and therefore sell it for cash, until they circle back to SHPO and submit their receipts and paperwork. All the work must be completed within 5 years or you lose the funds that have been allocated to your project. This means that SHPO has to receive the paperwork for both the completed project and the request for the tax credit voucher to be issued within the 5 year deadline. Am I, as an individual, limited to one application to the program, or can I apply multiple times? Homeowners are not limited to a single application to the program. However, there are restrictions. First, every application must contain more than $25,000 in budgeted work, for which you are eligible for a 30% tax credit voucher. Second, for a particular property you are only able to claim the 30% credit on the first $100,000 in budgeted work for each dwelling unit. So if you live in a single-family home (one dwelling unit), then you could do four applications that each had $25,000 in budgeted work or two applications that each had $50,000 in budgeted work. The total budgeted work over all the applications can exceed the $100,000 cap, but the credit you receive will be limited to 30% of $100,000, which is $30,000 in value to you. Third, you must fully complete your current application before you can submit another application. Practically speaking, this means that all the work has been done, approved, and that the tax credit voucher has been issued to the company you chose to purchase it. Can I use the credit to replace windows and doors for better energy efficiency? It’s very difficult to find an adequate replacement windows. SHPO has to review application using certain historic preservation standards and replacing original building fabric just doesn’t meet them. They rarely approve replacing original windows and doors. This is because recent studies show that a properly restored window with a good storm window provides the same and often better energy efficiency as a replacement. Very often a property owner is comparing the energy efficiency of a new window to that of an existing window in need of restoration. Can I use the credit to add air conditioning? Introducing or upgrading an HVAC system does qualify, but the work needs to be reviewed to ensure that the system is installed in a way that does not harm the historic building material. What happens if I sell my house and move before the five year owner-occupancy requirement is satisfied? It’s okay to sell the property before the five year owner-occupancy requirement has been satisfied as long as the home continues to be owner-occupied. One of the pages of the program’s application is called the “Owner-Occupancy Assurance Statement.” It essentially makes you promise that you will either live there for five years or sell it to someone else who will live there for five years. Suppose I bought a home that has been renovated using this program. Am I, as the new homeowner, limited in my ability to apply to the program? No, a new homeowner can apply to the program again to make additional repairs to the property. Once you took ownership of the property the budget reset and you are eligible to apply for tax credits on up to $100,000 in budgeted work for each dwelling unit. Can the program run out of money if too many homeowners apply for funding? Theoretically yes, the program does have a limited budget. SHPO can allocate up to $3 million per fiscal year in tax credits, which translates to total project budgets of up to $10 million. So it would take 100 homeowners applying for the maximum to exhaust the funds. Mary Dunne of SHPO, who is in charge of this program, reports that since 2000 they have never allocated the entire $3 million. And most years they only reserve between 30% and 60% of the total. The big thing that we haven’t mentioned this time is that in order to qualify for the program that the building needs to be a contributing structure in a Historic District (it needs to be old). And that the work needs to be appropriate for the historical nature of the house. The State’s tax credit program requires recipients to follow the Secretary of the Interior’s Standards for Rehabilitation, which are more specific as to what may or may not be done to a historic home, both on the inside and outside. Please always feel free to call about the program if you are interested in learning more (Kyle: 860-655-2922). We’ve done a good amount of research on it at this point, and know the answers to most of the basic questions. And we’re also able to get you in touch with the right people for your particular project or situation. 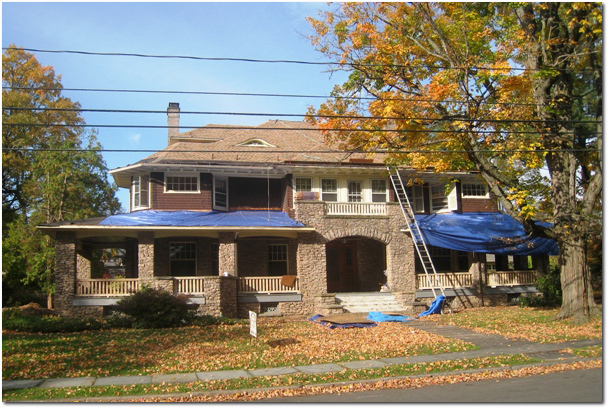 Last fall we wrote about the Historic Homes Rehabilitation Tax Credit, hoping to introduce it to our friends and neighbors. A year later we’re revisiting the subject for a variety of reasons. One is because it has come up in the WECA Architectural History and Resources Committee, and that group is looking to spread the word in any way they can. Also because people are beginning to take advantage of the program, so there’s a chance that someone you know has explored it. But most importantly, there is real money to be found here and just about every property in Hartford’s West End neighborhood qualifies. Think of it as a 30% off coupon that has a maximum value of $30,000. The Historic Homes Rehabilitation Tax Credit is a state program run through the Department of Economic & Community Development. Its overall goal is to assist homeowners in maintaining and renovating properties that are both designated as historic and in targeted areas of the state. Hartford is one of the eligible cities, and the West End is almost entirely covered by a patchwork of historic districts. Therefore, if a home contributes to its historic district (i.e. if a home is old), and is a four-family or smaller, then it qualifies for the program. Another main requirement is that the home must be owner-occupied as a primary residence for 5 years after the work is completed, though it can be with different owners. So far, so good. Next let’s circle back to the financial considerations. Homeowners get their project reviewed and approved in advance via an application. They are free to hire any contractor they choose to do the work, and by all accounts the contractor is not impacted since the homeowner is documenting the project and keeping the records. A single-family home can get 30% of their costs back on an application containing between $25,000 and $100,000 in budgeted work. Two important points are that the homeowner has to have the cash to pay for the whole project up front, and unrelated projects can be bundled in a single application. A multi-family home can go through this process once for each unit (up to four units in a four-family). The next important detail is that the renovations have to be historically appropriate for the house. 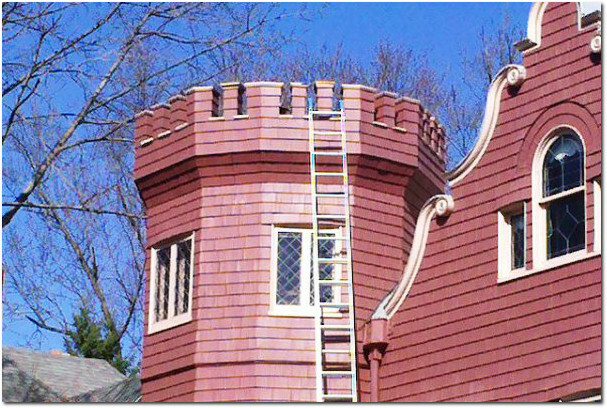 Most interior and exterior repairs, and mechanical system work, will qualify since that is considered maintaining a historic home. The official criteria is the Secretary of the Interior’s Standards for Rehabilitation, so homeowners planning to make modifications to their property should consult this guide, or the State Historic Preservation Office with specific questions. It seems to us that getting to the $25,000 minimum application budget threshold will require most homeowners to bundle 2 or more projects. Just painting a house, or replacing the roof, will not be enough. But both in the same year, or a combination of other projects, will be enough to qualify. Jan Klein, of Hartford, heard about the program on a few occasions before she began planning to use it herself. As Co-Chair of the WECA Architectural History & Resources Committee she had first learned about it when her committee led the effort to create the Oxford-Whitney Historic District in the neighborhood. More recently, she was reminded about the opportunity when a friend who lives in that newly formed Historic District talked about being involved in the process. Ms. Klein’s application bundled a bathroom update with four smaller projects to reach the budget threshold. The other work was primarily dealing with lingering maintenance issues on her home that would need to be addressed sooner or later anyway. Combining them with the bathroom project did increase the budget, but it also allowed her to qualify for the 30% savings via the tax credit program. Along the way, Ms. Klein learned that some of her smaller projects wouldn’t qualify. For example, she was not allowed to claim carpet installation because that isn’t a repair to a permanent structure. She also wasn’t allowed to include repairs to her non-historic detached garage. The application review process was quick and painless for Ms. Klein despite the five individual projects it contained. 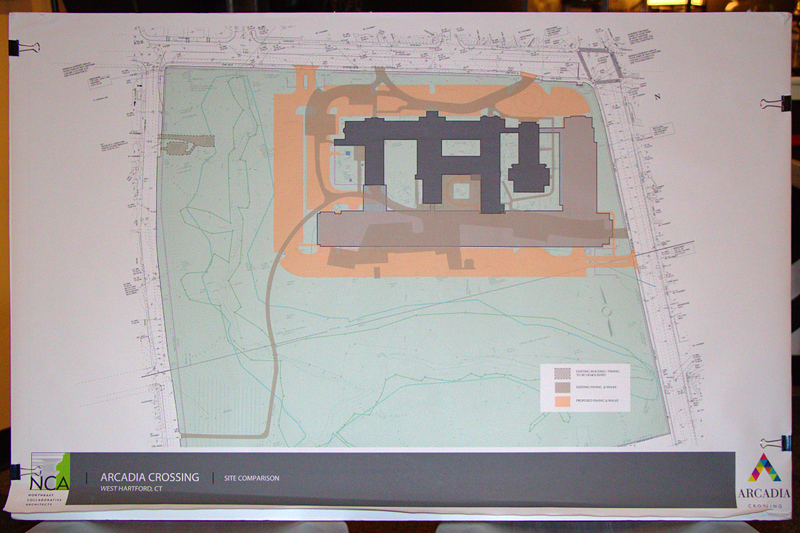 Lucas Karmazinas, her Co-Chair of the WECA AH&R Committee and a local Architectural Historian, provided initial guidance to get her started in the right direction. And Mary Dunne, of the State Historic Preservation Office, sat with her to review and talk through the initial filing. Though still in the middle of the program, Ms. Klein feels good about the process so far. The application imposed minimal delays on her construction schedule. She was able to hire her preferred contractors for each project. And she was able to include previously purchased bathroom lights and mirrors in the application budget. Her one remaining concern is claiming the full 30% value of the tax credit, since she has not yet submitted that part of the application. Finally, Ms. Klein reports that based on what she has experienced so far she would go through the process again. Her one recommendation is to have contractors budget generously in their initial quote. The tax credit is limited to whichever is lower, the actual amount spent or the application budget. So pushing a contractor to bid low could backfire if they discover additional repairs are needed once the project has begun. If you are planning some work around the house that might qualify for the tax credit, and live in a historic district or home, check out the program website for more information. Hopefully it will help you both preserve your home and save money.